Looking for ultra-modern decor to go with your minimalist style? We're guessing that this candle with a cement base is probably just what you're after. It's the right balance of understated and eye catching. You'll also love that the materials are simple to find and very affordable, especially if you buy them in bulk. 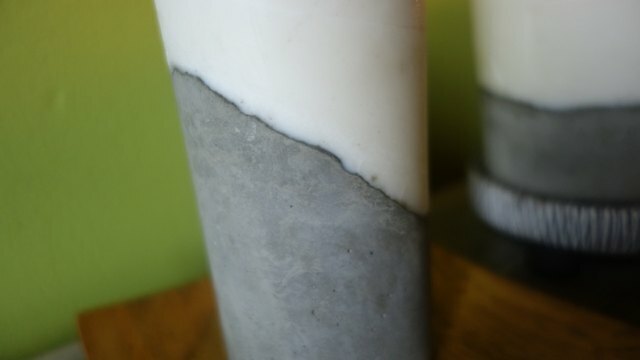 This also means that you can get enough materials to churn out a bunch at a time, so these unique candles would make perfect handmade party favors or gifts. 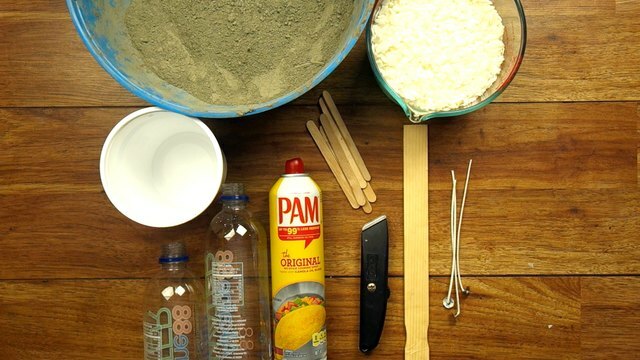 The containers should be thin enough to be easily cut with a utility knife and torn apart with hands. 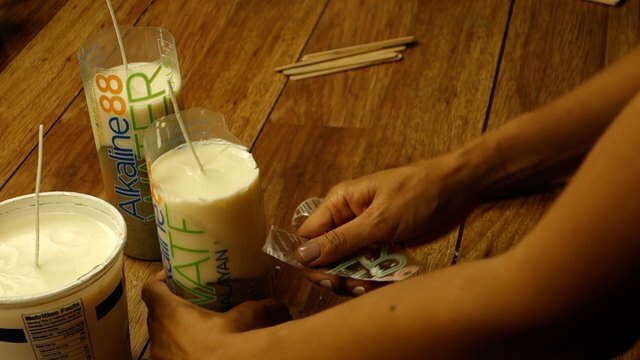 Examples include: thin plastic water bottles, yogurt/sour cream containers. 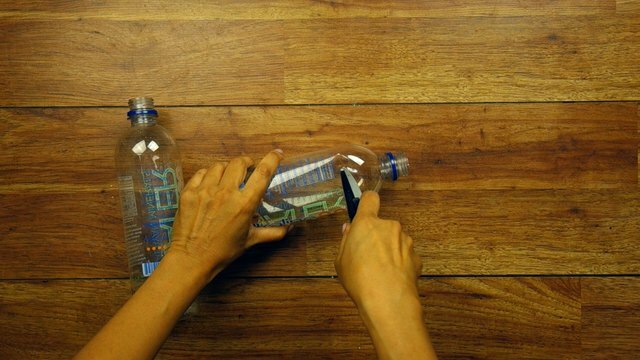 Disposable plastic water bottles are ideal for this project, and the bottle tops can also be used as funnels in Step 3. 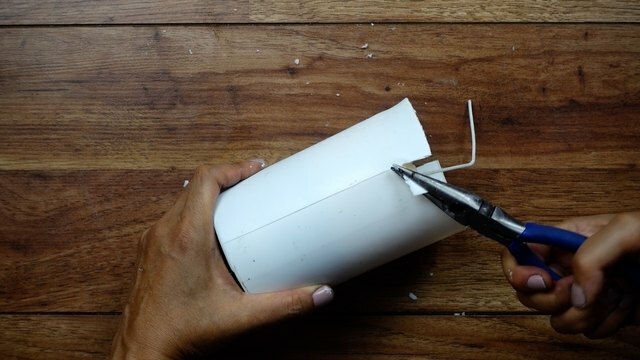 If using a container with a narrow opening, use a utility knife or scissors to cut a wider opening. 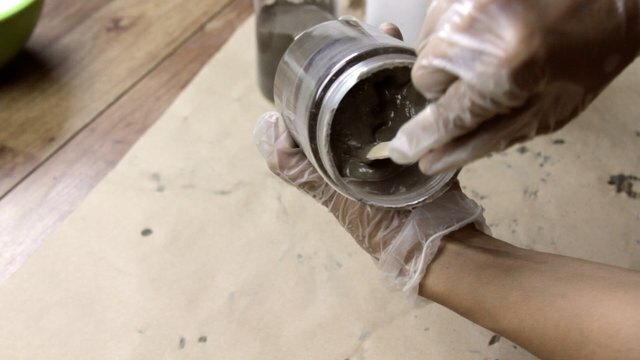 This will make it easier to add concrete and wax to your mold. 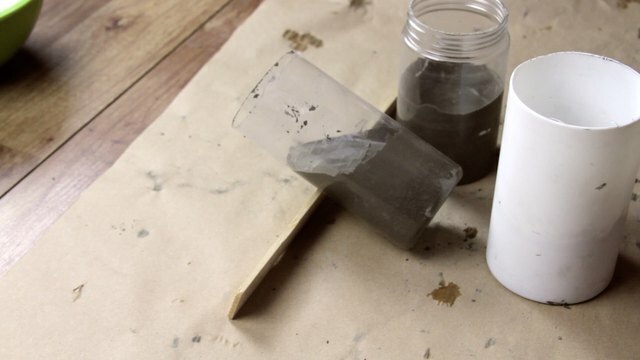 Add water to your cement or concrete mix. 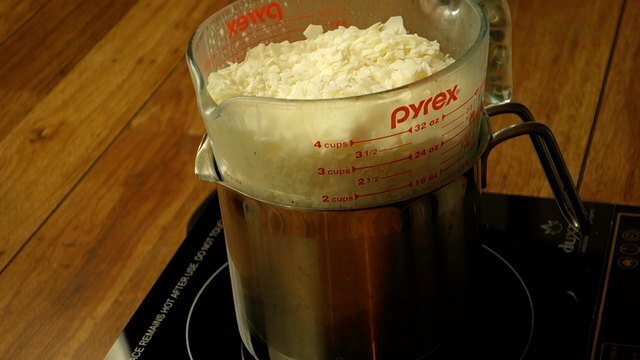 For this project, you'll want a thick cake batter consistency. 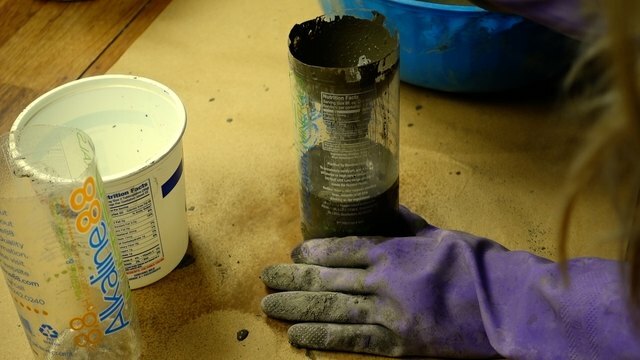 Before putting the cement mix into your containers, coat the inside with non-stick cooking spray as a release agent. This will make it much easier to remove the cement from the mold. 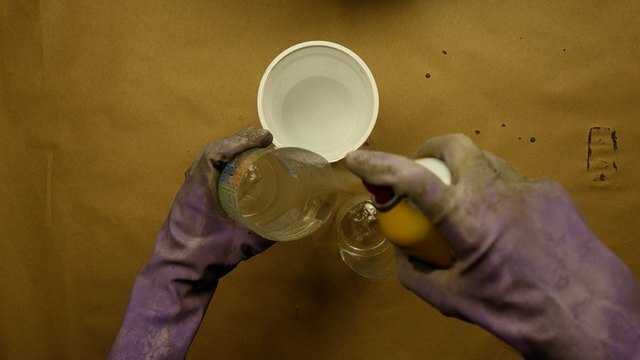 If using a plastic water bottle as a mold, invert the bottle top and insert it into the cut edge to make a funnel. Fill the containers one-quarter to one-third full. To force out bubbles that may be trapped within the wet cement, agitate the container by firmly hitting the bottom against your work surface. You'll know to stop when you no longer see any bubbles rising to the surface. Before leaving your cement to set, select your desired cement base styles. You can create a basic (straight wax-cement border) base, or choose from two style options: 1) uneven wax-cement border 2) diagonal wax-cement border. Scroll down to the bottom of this tutorial for an explanation of and directions for these options. The time it takes for your cement or concrete to set depends on the materials you use, the ambient temperature, and how much water you mixed in. This can be between 24 to 48 hours. 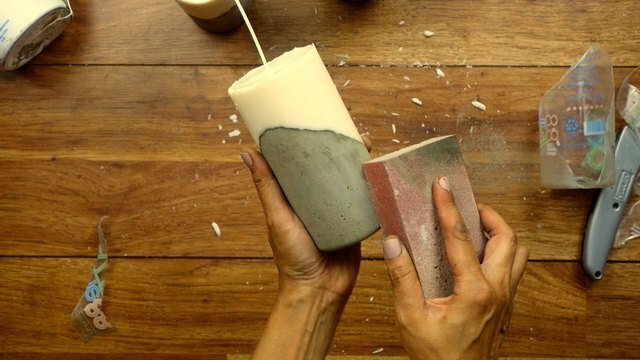 Once your cement has set, melt enough wax using the double boiler method to fill your candle molds. It's best to melt less than you think you'll need, as you can always melt more as needed. 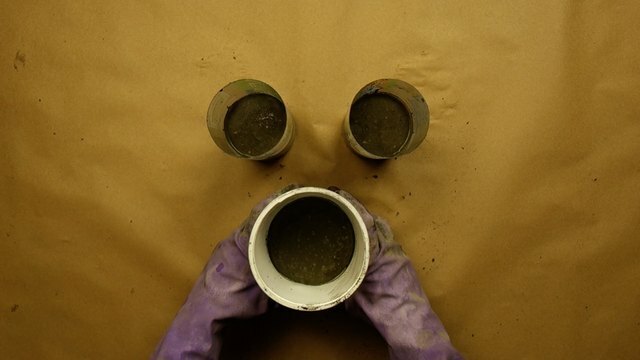 Before placing the wicks, carefully check the sides of your containers to see if any flecks of cement have hardened there. If so, scrape them off to make sure you have a clean mold for your wax. 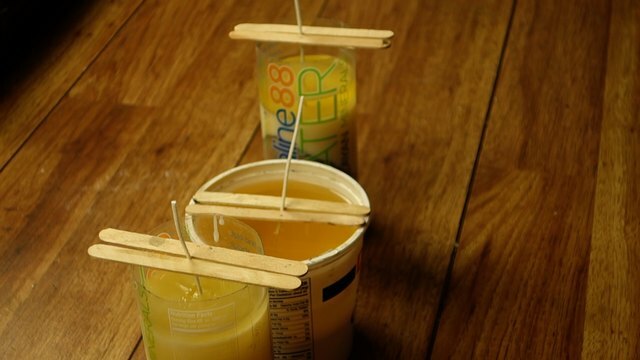 Place each wick in the center of the mold, and hold them upright by placing two popsicle sticks (or pencils, pens, chopsticks, etc.) on either side of the wick upon the top edge of the container as shown below. 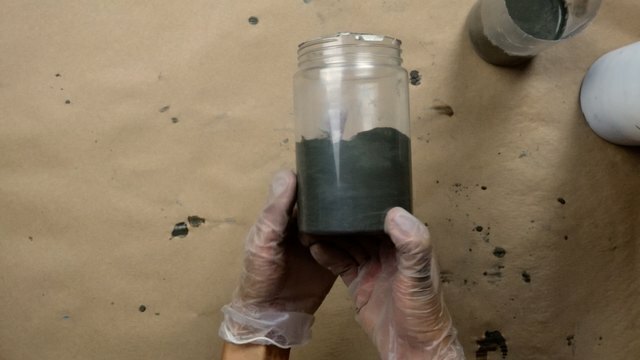 Pour the wax into each container atop the hardened cement until about two inches from the top edge. 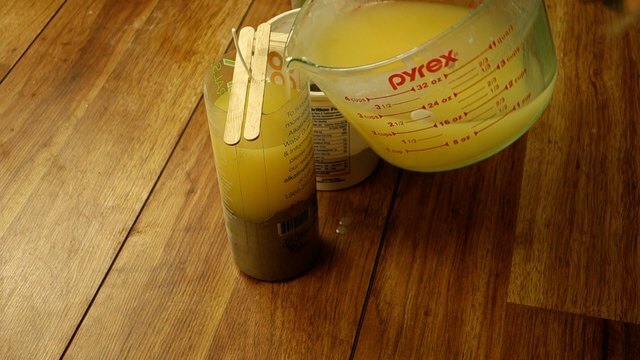 Leaving two inches of empty space at the top is important for easy removal once the wax is set. Let the wax cool completely. 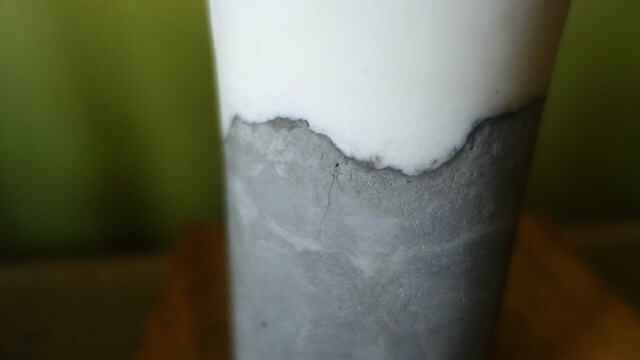 Note that depending on the container you choose, the wax may seep into the space between the top edge of the cement and the container, which may cause the cement to darken in that area and/or it can coat the area with a thin layer of wax. 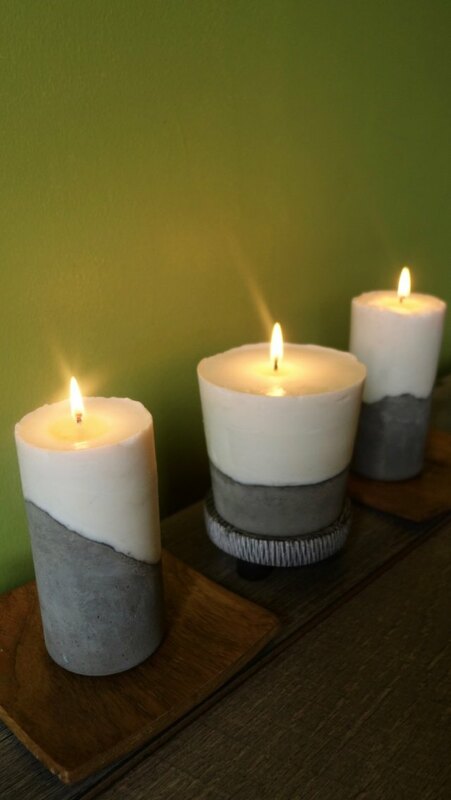 You can choose to leave it as is which can create a cool stratified look or you can sand it down to achieve a cleaner look like the candles shown in the main image above. Once the wax has completely cooled and hardened, cut one- or two-inch slits all around the top edge of the plastic container as shown below. This is why it was important to leave some empty space at the top of the container. Tear off the container in sections, using the slits at the top as starting points. 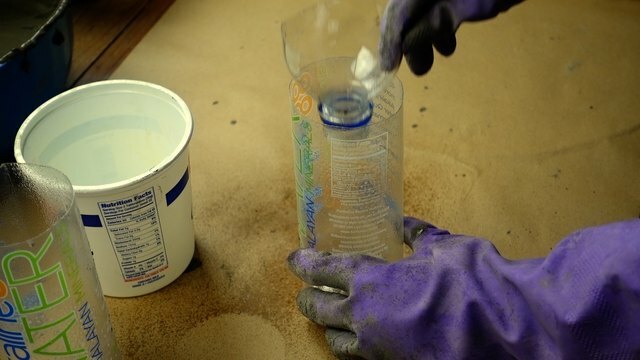 The cooking spray used should make the concrete base easy to remove from the mold. 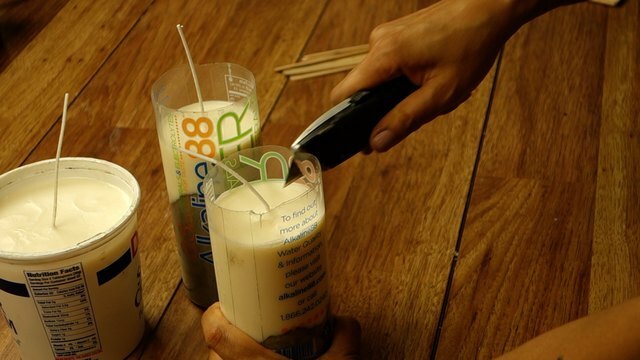 If the plastic container you used is too tough to tear open using just your hands, use your utility knife to score down the side of your container (not so deep that you score through the candle!) and use a pair of needle nose pliers to help you to tear off the mold. Sand the cement if you'd like a smooth and more even-colored surface and to remove any marks you may have made when tearing/cutting off your mold. 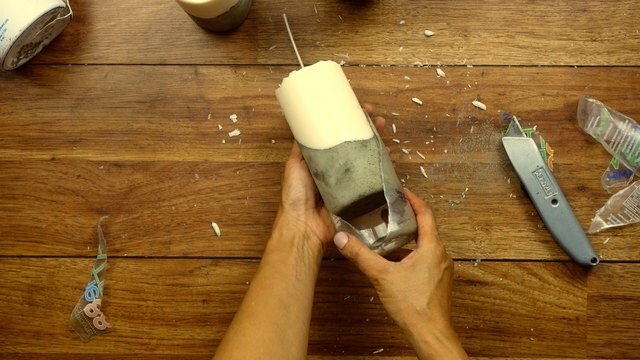 Clean the surface of the candle using a paper towel or rag. 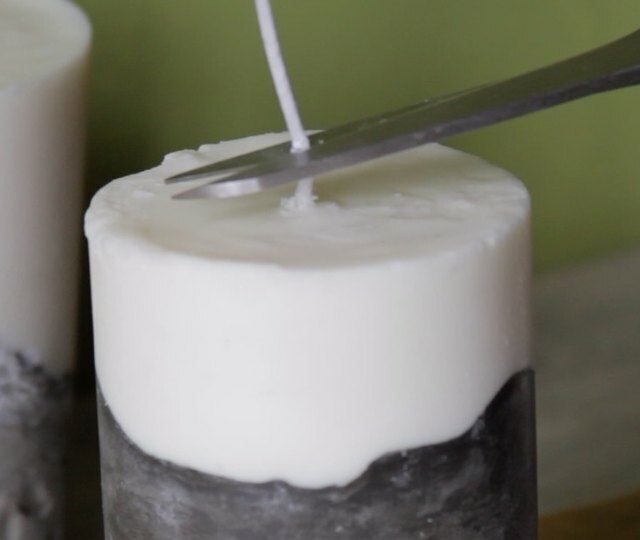 Trim the wick to about one-eighth of an inch. 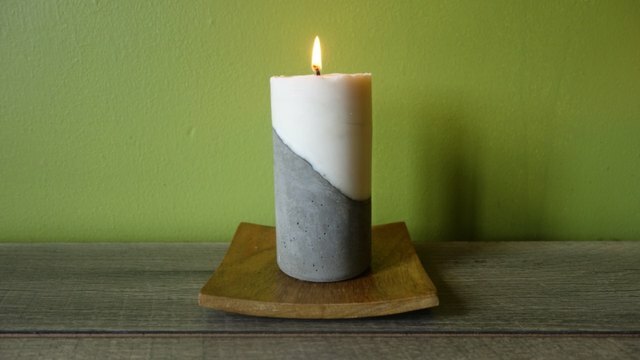 Light your chic new candles, put on some chill tunes, and enjoy the ultra-modern ambience. This is basically the default, do-nothing style, which you may prefer for its simplicity and clean look. After shaking out the bubbles in Step 3, simply wipe the sides of the container clean, set it upright, and let the cement do its thing. For an uneven border, wait for the cement to partially set so that it has firmed up a bit, but is still moldable. 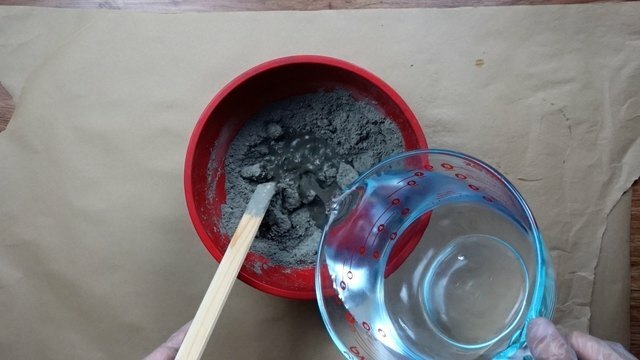 Then, use a popsicle stick or similar disposable object to make a well in the center of the cement base and push the cement slightly up the sides of the container to create an uneven border as shown below. 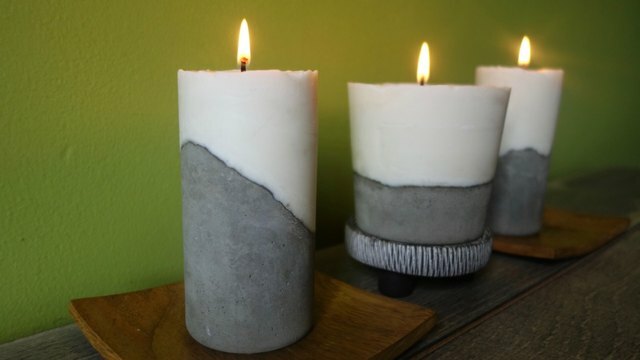 To create this effect, prop up your container at an angle so that the cement will set at an angle. A paint stir stick works well for this. Allow the cement to set this way about halfway through. If the cement base has set long enough, it should still maintain its diagonal shape when you place it upright. If it doesn't maintain its shape, leave it to set at an angle for a bit longer. 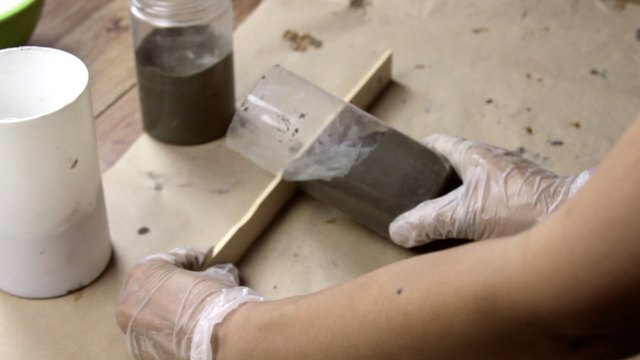 Once it's set long enough to keep its angled surface (but is still moldable), use a popsicle stick to create a shallow well in the center bottom of the partially set cement. This will give you an area in the diagonal surface where you can set your wick later. Now, let the cement set completely.